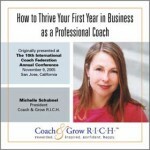 Better Than Flowers And Chocolate - Coach & Grow R.I.C.H. Get Your C&GR “Better Than Flowers & Chocolate” Gift Basket Items Here! Originally presented as a half day workshop at the 10th International Coach Federation Annual Conference, this content rich training with industry-expert Michelle Schubnel features step-by-step training, lively audience participation, helpful role plays, real-life case studies, specific examples and concrete action steps.